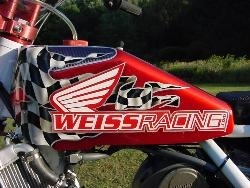 Weiss Racing, Inc. is a small operation specializing in billet aluminum racing parts. All products are C.N.C. machined out of high quality billet aluminum.Owner, Bob Weiss has been supplying parts to the many of the top GNC racers and teams including Ken Coolbeth, Mike Hacker, Bryan Smith, Jake Johnson, Kevin Atherton, Jared Mees even Springer, just to name a few. Parts are shipped almost everyday via Priority Mail. We accept all major credit cards. To check out the latest in clamps and other available products, click on the "Products" tab.